"Getting rid of Muslim stereotypes just by playing sport." At a community centre in Birmingham flanked with world flags, with punchbags hanging from the ceiling and boxing gloves lining the walls, a group of year 7 pupils stand in front of masks and foils. It's their first class of fencing and the girls are looking forward to a bout of sparring. Taking off her mask after a bout, Ramla Omar, 12, from Ark Boulton Academy, says: "The best thing was getting a hit on your opponent and then dodging. I've only seen it when I was little, and really wanted to have a go." The "Muslim Girls Fence" project in the Midlands was set up to challenge misconceptions of young Muslim women by Maslaha, a charity that finds creative ways to tackle longstanding social inequalities in Muslim communities. Maslaha says the project's aim is important particularly "in light of complex discrimination experienced by this group on the basis of both faith and gender". 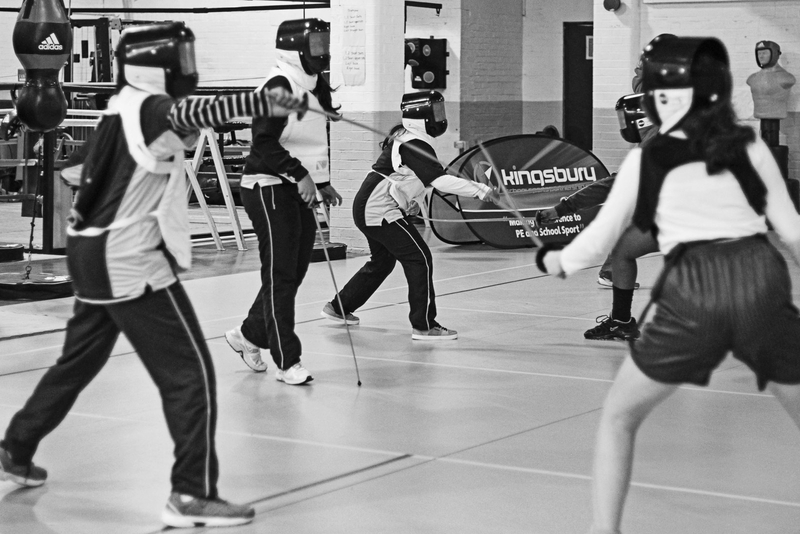 Throughout the chilly winter's day, 60 girls aged 11 and 12 turn up at the Firs and Bromford Wellbeing Centre where they learn to fence and attend a workshop about women in sport to discuss identity and belonging. They meet Georgina Usher, the British fencing champion, who is also chief executive of British Fencing, the sport's national organisation. "This is a special project to me, and there is something powerful about picking up a sword, and one of the objectives is to show fencing in a different light," Usher tells BuzzFeed News. She says fencing, a non-contact sport typically viewed as a pastime of white men, was attractive to her when she was young because of the technical skill required. 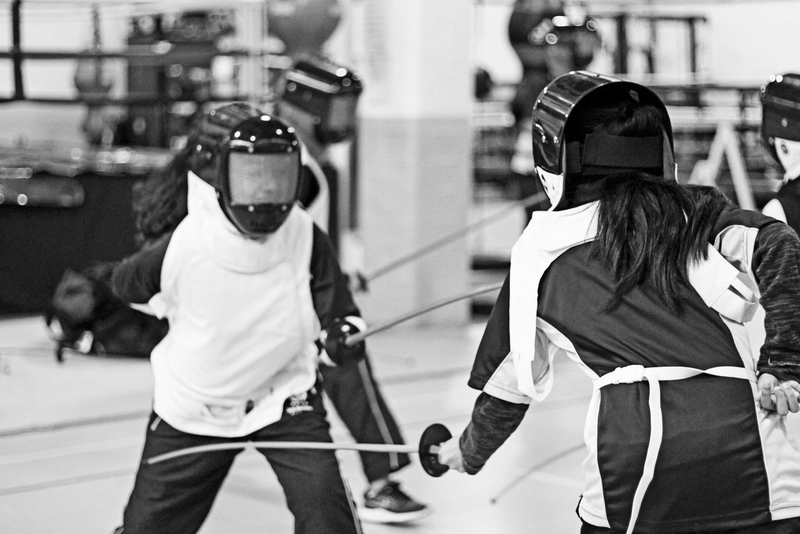 Because athletes put on gear and are covered up, fencing is a sport that can be more inclusive for participants who prefer this – including the Muslim students at the workshop, many of whom wear hijab. The coach gets the girls to run in circles and dart around cones in the gym, warming up. Afterwards, they stand in a line, pick up their foils, and don their masks and jackets to begin learning basic techniques. There is intense concentration as they work out their footwork and stances, but within an hour they are practising hitting and dodging each other. "It's fantastic, and for me the first American Muslim woman fencer who took a bronze in Rio is a role model," Usher says, referring to Ibtihaj Muhammad, who made headlines as the first American athlete to wear the hijab during the Olympics. "Step by step we will change the world. The project is small, we're small. But what we've set out to do is make a difference and change perceptions." 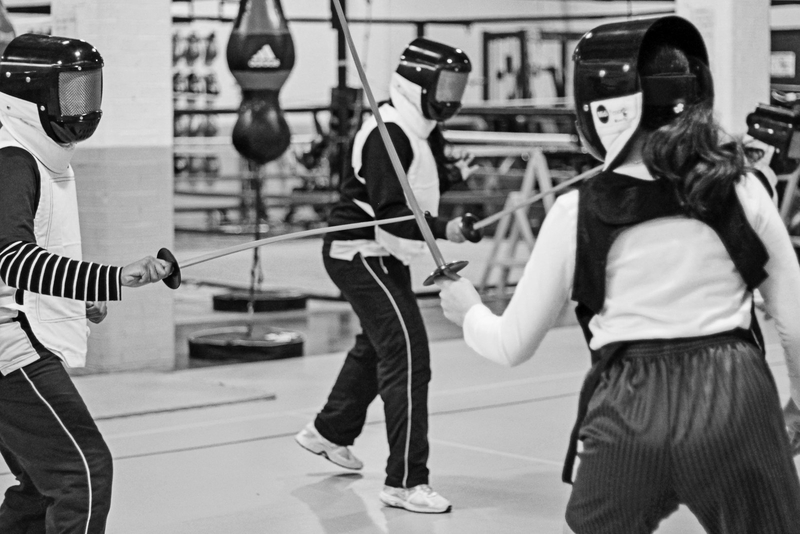 Pupils mentor each other as part of the project, so four year 8 girls from Frederick Bremer School in east London who have previously taken lessons have travelled to Birmingham to show the new fencers their skills. Earlier in the year the older teenagers were part of a photographic series and film documenting their experiences that showcased at the Southbank Centre in March 2016 as part of the Woman of the World Festival. When the year 8 pupils walk into the sports hall, they are surprised to see huge photos of themselves in action hanging on the walls. "It's definitely something I want to carry on," says Seher Chohan, 13. "It makes you more confident and unique and is something that brings you together." Her classmate Sarah Said, 14, has always been into sports and plays basketball. “I didn’t even know what to expect. I was picked to take part but was sceptical," she says. "It was funny because in the film Parent Trap there’s a scene where the girls are fencing and do this stance and that's what I copied. Everyone did the stance and then we were told that was the wrong way – then we were taught the right way." She adds: "What we were doing was getting rid of Muslim stereotypes just by playing sport." Serhildan Gocmen, 13, after a lively battle with a peer, puts down her foil and says: "If I had more opportunities like this I would definitely continue." She adds: "I watched some Olympics and I felt really proud of myself and was telling my sister their moves. "Most people don't know about it and so I was interested. Girls don't get this sort of opportunity and people are biased, saying Muslim girls can't do this – it's mostly white British men doing it – but now it's getting heard around the world so that lots of people can pick it up." When the initiative first began in east London, 25 students learned how to use their foils for two-hour lessons over the course of 16 weeks. It will now be rolled out across the Midlands in the new year. “It is not an easy time to be a Muslim girl in the UK," says Latifa Akay, project manager at Maslaha. "Persistent negative stereotyping, combined with counter-extremism policies that are operating to stigmatise young Muslims, means that more than ever Muslim girls and women find themselves spoken for as opposed to spoken to." She adds: "This project aims to reinstate Muslim girls as their own storytellers, and to open up a space for Muslim girls to articulate and express their identity on their own terms."